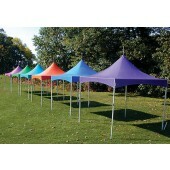 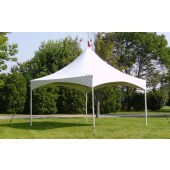 Welcome to Canopymart Tension Peak Party Tents Selection! 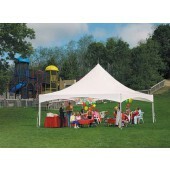 Our Tension Peak Top Party Tent is the tent for the person who won't accept anything other than the very best. 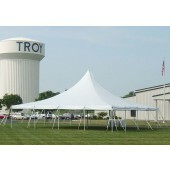 These durable tents are constructed with the most skilled craftsmanship and offer the best mix of style and function in the industry. 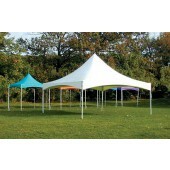 Made with the highest-quality materials, Tension Peak Top Party Tents are perfect for any outdoor revival. 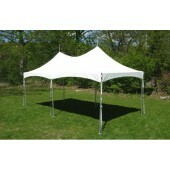 Tent frames are made of heavy-gauge steel, galvanized and are triple-reinforced at stress points for added reliability. 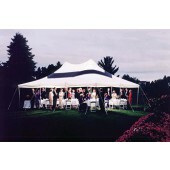 Tension Peak Top Party Tents come with a 15-oz 'Block Out' laminated vinyl bag that offers unparalleled protection from rain, wind, sun, and any other conditions that could prevent you from taking the festivities outdoors. 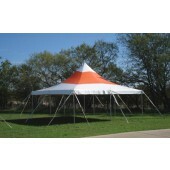 In addition to the structure of the Tension Peak Top Party Tent, two-inch seatbelt webbing around the perimeter adds strength and really secures the canopy in place. 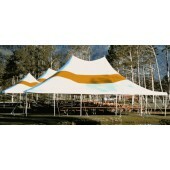 ALL OF OUR TENSION PEAK TOP PARTY TENTS ARE FLAME CERTIFIED. 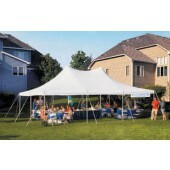 Enjoy our Free Shipping offer in the Continental United States for all of our Tension Peak Top Party Tents.